The problem of how to respond appropriately to gross and systematic violations of human right that happen within the territory of a sovereign country has been subject to much international debate. On one side, there is the appeal to our shared humanity and the urgency to help those who are suffering no matter where in the world. On the other side, there is the international principle of non-interference in domestic affairs of sovereign countries. Arguing that human rights are a greater principle than sovereignty, the United Nations has promoted many humanitarian interventions that use force as a means to achieve its goals, understanding that consent is not necessarily needed, especially when the government of a country is the one attacking its own population and causing the humanitarian crisis. In 1992, in Somalia, UN forces suffered heavy human losses and found enormous resistance in the provision of humanitarian aid. Fearing a recurrence of this, the international community took three months to act in Rwanda, in 1994. In the meantime, one million Tutsis were brutally exterminated. The failure in one African country sealed the fate of another, resulting in the first case of genocide since the Holocaust. It became evident that a new consensus on responses to massive human rights violations was needed to help the international community to respond more efficiently and avoid new genocides. In 2001, the “Responsibility to Protect” doctrine was created as a solution to the problem of how to respond to gross and systematic violations of human rights that happen within sovereign states. It sets out clear criteria for humanitarian interventions and an answer to the sovereignty dilemma. It argues that, to have their right of sovereignty respected, states must be able to provide security to their people. When they fail to do so, the international community is not only legally authorised to intervene in their internal affairs, but it also has the responsibility to do so in order to prevent and protect people from violence. This new concept delegitimised the discourse of leaders who appeal to the principle of sovereignty to protect themselves from any external interference while committing crimes against their own population. However, in spite of being endorsed by the United Nations General Assembly and the Security Council, the R2P principles that endorse humanitarian interventions remain controversial and the doctrine is as acclaimed as it is criticised. One of the main criticisms is that states can invoke R2P to justify any military intervention, or that they would only do so based in their national interests. In 2011, the R2P-based intervention in Libya was accused of being a pretext to carry out regime-change. This has yielded global concerns that the R2P principles were used as a political excuse to intervene in the country’s affairs. As a result, Russia and China have later vetoed several attempts of humanitarian intervention in Syria. It is also very hard to assess the efficiency of an intervention. Even when it is considered successful, there will not be any evidence to show what would have happened without the intervention. And while the benefits of the intervention might not be visible, the costs are, and any destruction caused by it will raise questions about its legitimacy and success in preventing harm. But, ultimately, the main weakness of the R2P doctrine is that it is not legally binding, which makes it more of an aspiration rather than a real international norm. 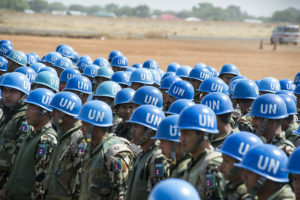 The United Nations relies completely on its member states to provide military force for any intervention that wishes to undertake, and has therefore to deal with the fact that, in most cases, they will put their national political interests above human rights urgencies, resulting in arbitrary decisions whenever a crisis requires the application of the R2P principles. All these difficulties show that the R2P doctrine is far from being the solution to the problems the UN faces when trying to tackle gross human rights violations. Urgent reforms are needed in the areas of international peacekeeping, Security Council and General Assembly Reforms. But how could the UN be changed to effectively deal with all of its challenges? In our event: “UN: Peacemaker or toothless tiger? Are you interested in how to reform the United Nations and bring about a more peaceful world?”, Vijay Mehta, Author and Chair of Uniting for Peace, will explore, analyse and put forward proposals for how the UN can become a relevant organisation fit enough to tackle the huge threats and challenges of 21st Century. Come and hear him and Dr. Claire Duncanson, Senior Lecturer in International Relations in the University of Edinburgh explore how the UN can overcome these challenges.